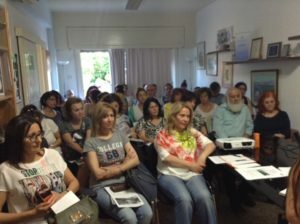 The Fibromyalgia group of the Cyprus League Against Rheumatism, organized an event for the Fibromyalgia Awareness day, on the 12th May 2017. During the event, ENFA President and Vice-President of CYPLAR Souzi Makri , presented in summary the main achievements of the Organization since its Inaugural meeting in 2003. The film MONIQUE, a personal story of living with Fibromyalgia, was played during the event. The presentations were followed by an interactive workshop with a reflexologist who showed ways to help alleviate the pain and revitalize the body.